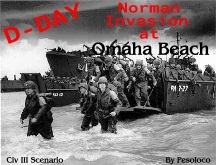 This scenario recreates the scene of the Allied invasion of Omaha Beach on D-Day: June 6, 1944. You play as the Allies and attempt to capture/liberate the three German-controlled cities. You will start out by loading up your troops onto transports and moving them over to France as soon as possible. Move across the beach with caution because the first line of hills is guarded by German artillery. You then cross into a mine field. On the other side of the mine field is a giant cliff-hill that is protected by German artillery bunkers. These bunkers must be breached if you hope to stand a chance at taking the towns. Good luck, soldier! You must download and install the Land Mine unit before using this scenario. This map is designed to give you action right away. You are placed on a small island with 15 other civilizations. It's a race for land and resources!